Thank to you all our Contributors so far! Mar Vista Chamber’s Make It Mar Vista: Small Business Saturday Event is taking place Saturday, November 28, 2015. We envision inviting people from our community and beyond to interact with local businesses, local artists and each other for a day of true community engagement along our Great Street of Venice Boulevard. We'll work with many partner organizations to make this event a reality, including LA Bike Coalition, Vineyard Christian Fellowship, Green Communications Initiative, City Councilman Mike Bonin's Office, A Kid's Place Preschool, and Grand View Elementary School. We have many amazing events planned for activating the Great Street for Make it Mar Vista, inlcuding a Kickoff Bike Parade, a Pop-Up Protected Bike Lane with Sustainable Planter Boxes, a Mar Vista Passport game, a Paint-by-Numbers Community Mural, Wayfinding Signs to encourage walking, Sidewalk Directions and Activities, the Story Corps Mar Vista Living History Project, the Artify Mar Vista Interactive Art Projects, and Live Entertainment at the Main Event Hub. We enthusiastically look forward to engaging the community through the Make It Mar Vista: Small Business Saturday Event! Our team plans to activate stakeholders in Mar Vista with massive outreach efforts, tapping into our networks and making sure everyone knows how they can be a part of this event. We'll do marketing across all possible platforms to ensure a great turnout on the day. We'll meet with City Officials to plan the bike lane logistics. We'll work with the Mar Vista Community Council. We'll work with local artists who'll help design the Atrify projects. We'll all be working to plan activities that will be engaging to all age groups. And we'll work with all the local businesses in our network. Venice Blvd. is the heart of our Mar Vista community and when it was chosen as one of the Great Streets, it gave us the opportunity to transform it from the State Highway is has been into the Community Hub it can be. We want to see people walking and biking safely up and down its length, we want to see businesses thrive with new and returning customers and we want to see artists' work wherever we look. We think this event will engage our Community and inspire permanent changes we all want to see happen here in Mar Vista. On behalf of the entire team of volunteers working on Make It Mar Vista, I want to express our thanks to you! Your support means the world to us and we’re truly grateful for your contribution! Some of you have decided to remain anonymous and some of you have not given us an email address - and we respect that! But we still want you to know how grateful we are! We hope to see you on the big day itself since it’ll be so much fun and since you’re part of the reason it will happen. Saturday, November 28, 2015. 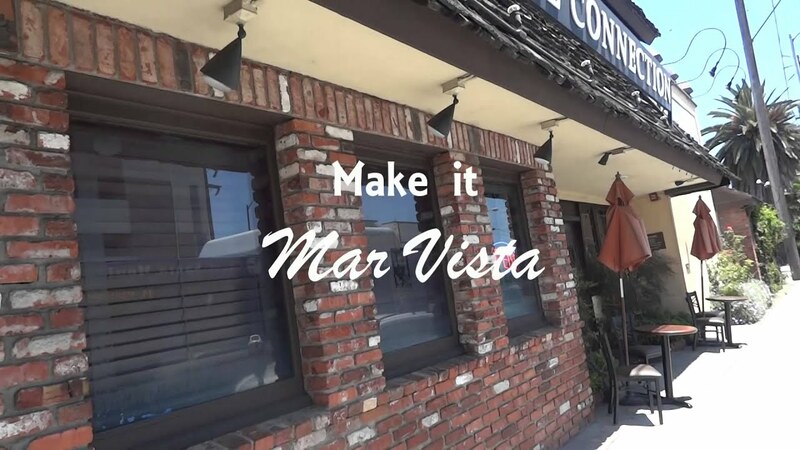 Make It Mar Vista wants to give a special shout out to our community Real Estate teams! They're really stepping up to support this event. Thanks to The Noel Team, Preferred Properties LA, and Westside Green Real Estate. The challenge is on! Any takers? We're excited to get to work on Make It Mar Vista. We are busy behind the scenes getting everything ready. For those who came out to Ciclavia, you saw us there promoting this great event which will also take place along Venice Blvd. What a great street! If you've been thinking about supporting us, don't hesitate, jump right in! And don't forget you can contact us offline on ways you can participate as a volunteer or business. Let's make it happen. Let's Make It Mar Vista! We're asking for a donation of $11.28 to help make this project a reality! Your contribution of $11.28 is symbolic because it will help you remember that our event takes place on 11/28 - and because it means you want to see this kind of project happen in West Los Angeles. Thank you! A donation of $50 will help us host great kids activities at the event like mini art projects, games, and magic! We want kids to have fond memories of the place where they grew up. A $100 donation will help us begin work on the Mar Vista Legacy project. Through video and interviews we want to capture our community then and now. We will enlist our seniors to tell us about life in Mar Vista over the years and upload these interviews to the National Archives so that our community will always have a place in history. A $250 or more donation says that you want to partner with us to make this event a success! Your donation allows us to bring in art, music, games and fun to Mar Vista for a great day of community engagement! A $500 or more donation will help us re-imagine Venice Boulevard. Our demonstration projects include a protected bike lane, parklets, art installations, sustainability projects and other features that we would like to see permanently along our Great Street. The Volunteers will be needed on the day of the event to stuff goodie bags, help with the games and prizing, to help set up the home-base hub and entertainment area, as well as clean up all the above. There will be opportunities to set up art projects, recording projects and the bike lane project. And we would welcome all the help! Thank you!